Jenny Lunn comes from Saddleworth in northwest England, an area at the heart of the British brass banding tradition. After a miserable musical start on the violin (far too ladylike and genteel), she found her match with the trombone at age 10. She was taught initially by an orchestral trombonist thus learned to read bass clef, so she has played the bass trombone part in brass bands ever since. 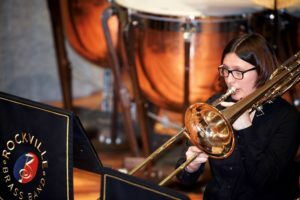 She first played for Chadderton Band and Oldham Music Centre Youth Band (both in Oldham, Lancashire), later for Abbey Brass (Abingdon, Oxfordshire) and Crystal Palace Band (southeast London), and briefly for Northfleet Brass (Kent). Highlights of the UK years were the annual outing to the world-famous Whit Friday Brass Band Contest and reaching the finals of the National Youth Brass Band Championships to play at the Royal Albert Hall in London. Jenny has spent many years working in different parts of the world while her trombone languished in storage but was keen to start playing again following her move to Washington DC in 2014. She was delighted to find a British-style brass band on the doorstep and was at a Rockville Brass Band rehearsal within a few days of arriving in the country! She enjoys playing music from the traditional brass band repertoire, as well film and stage tunes, and arrangements of classical works. However, she will complain about any piece of music with a sharp key signature; it is a common affliction of bass trombonists that they can confidently handle seven flats but panic at the sight of a single sharp!